Happy WOYWW! Welcome to What's On Your Workdesk Wednesday! I hope you have as much fun as I do checking out desks worldwide! On my desk today is the beginnings of a Youtube video I'm making that will teach you how to do your own dry embossing WITHOUT embossing folders! Right now everything is a massive mess since I've been doing lots of cutting with my Silhouette Cameo and getting things ready to film. 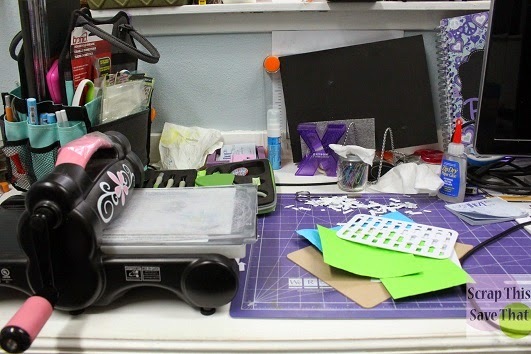 On my desk, you'll find my Big Shot and and all the pieces and parts to do embossing on your cards and projects. I had a little wrinkle with my blog and domain name a few days ago, when the person serving my site, took down his servers and moved! It's going to take a few more days to get things up and running again, so in the mean time, I'm back to my blogspot address. Please stick with me and keep coming back! Things will work smoothly again soon! Thanks to those of you who left such sweet comments about the Snap Book I made for my daughter's bridal shower last week. For those who asked to see more, I wrote a post with LOTS more info and photos. You can find it HERE. And for those of you who like to hunt for the WOYWW button/badge hidden on my desk each week...good luck! I made it harder! Let me know if you find it! Oooh, I LOVE your purple cutting mat! The lime green paper looks awesome against it, you don't need to show anything else, lol! Yep, I saw it too in the whatever that holder is! You are so brave to make youtube tutorials! Maybe someday I will be as brave as you! Good luck with the YouTube video, very brave lol! Happy crafting, Angela x @Felix the Crafty Cat. I haven't learned the art of making videos yet! :) or of doing embossing w/o the folders. Sounds interesting. Thanks for the peek. Looking forward to seeing your video. It's not hard really but I did find getting the music to fit in a nuisance! Happy WOYWW! I took a peek at the inside pages of the snap book you made for your daughter. It is wonderful and I specially liked that you left space for advice and journaling!